Open Audition Dates for Next Season are Set! 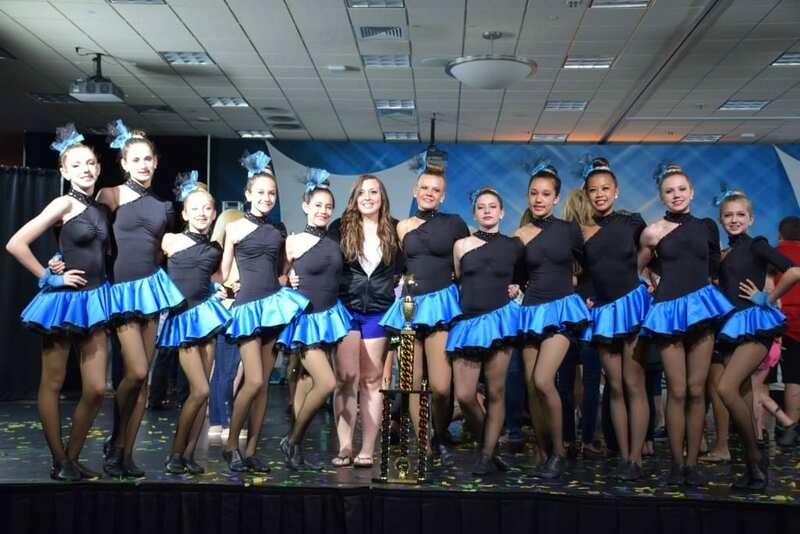 The Beth Fowler School of Dance Performing Group of Genoa and St. Charles recently competed in the Legacy National Dance Competition which completed their 2015 season. The event was held from June 22nd thru June 26th in the Wisconsin Dells and was a National Competition with over 854 routines. Beth Fowler’s dancers competed in three different age groups and took 1st Place in all of them. At the end of the week, all three Beth Fowler School of Dance (BFSD) age groups were asked to compete in the National Showdown which is the “Best of the Best Final Competition.” In the Final Showdown the BFSD Seniors (ages 16-19) took 2nd with Lyrical Dance “Forgetting” Choreographed by faculty member Hannah Bohn. The BFSD Teens (ages 13-15) took 2nd with Hip Hop dance “Bad Girls Club” choreographed by faculty member Miguel Villagomez. The Juniors (ages 11-12) took 1st Place in the Showdown with Jazz Dance “It’s Britney” choreographed by Brooke Fowler. This made “it’s Britney” undefeatable all season! All BFSD Dancers received the highest Platinum Awards at Nationals as follows. Beth Fowler said, “Our motto is Proper Start….. Successful Future. Our main focus is not competition but we do well in it because our main focus is getting our dancers off to a great start with a stepping stone progressive dance training program. Our main focus and most rewarding thing is not the awards we win but watching the dancers progress through the different levels putting good technique and performing in the theatre as our first priority. From there, the dancers are prepared to successfully take on any challenge.” Beth Fowler School of Dance has been training dancers from ages 3 thru adult for over 32 years. However; the school just started competing in 2013 and has taken 1st place over all every year. All Beth Fowler competitive dancers have received their dance training from the Beth Fowler School of Dance. The dance school’s program focuses on training dancers for excellent technique and performance artistry. This training has enabled the dancers to secede at a high level of competition in a short time. All students have the opportunity to learn the skills needed for the competitive style of dance even if they do not wish to compete or perform. This is through a class titled, “Turns & Tricks.” The dance school also added a new class last Fall of Acrobatics which has enhanced the dancer’s abilities to do additional tricks. The Beth Fowler School of Dance presents 3 dance productions a year at the Egyptian Theatre and has an additional Performing Group for community events and competitions as a bonus performing opportunity. Auditions for next season’s teams are set for August 1st and 2nd 2015 at both the Genoa and St. Charles BFSD locations. Also the Beth Fowler Dance Company (non-competitive company) is also holding auditions at the end of the summer in Summer Camp Workshop D. The Beth Fowler School of Dance is currently taking enrollment for 1 and 2 week Summer Dance Camps. Summer Camps are strongly recommended, especially if wishing to audition for both or either group. For more information visit www.BethFowlerSchoolOfDance.com or phone the Genoa Location at (815) 784-5658 or the St. Charles Location at (630) 945-3344. The Beth Fowler School of Dance Performing Group Intermediate group dancers are: Olivia Arias, Becky Baert, Brooke Born, Olivia Burns, Hannah Fugiel, Sophia Gapuz, Cameron Holst, Shannon Jackman, Kylie Ryder, Alyssa Vicory, Kaitlyn Woods, Amanda Veldhuizen, and Katie Woelffer. The Advanced Group dancers are: Gabby Boone, Taylor Donzelli, Lindsey Haugen, Lauren Hribar, Maddie Karlow, Justine McCormick, Fiona Mcmanus, Rachel Olson, Alexa Orlando, Giuliana Piga, Jen Sauber, Hannah Whitten, and Haly Young. The Hip Hop Team in “Bad Girl’s Club” are: Haley Anderson, Gabby Boone, Brooke Born, Olivia Burns, Taylor Donzelli, Mary Rose Fair, Jennifer Flatland, Genevieve Franz, Sophia Gapuz, Breanna Hamrick, Lindsey Haugen, Maddie Karlow, Mackenzie Kowalski, Rebecca Mayer, Justine McCormick, Carissa Nazlian, Anna Nolazco, Alexa Orlando, Giuliana Piga, Renee Porter, Anna Raimondi, Kylie Ryder, Jen Sauber, Alyssa Vicary, Misty Villagomez, KatieWoelffer, Kaitllyn Woods.